Do you have keys that don't work on anything? I have one or two that I'm not sure which locks they will open. Have you ever seen a Skeleton Key? All the doors in the house where I grew up all had skeleton key style locks. You don't find new houses these days using Skeleton Keys for locks anymore, they just didn't provide any kind of security. It's a difference in technology. What worked in the days of Skeleton keys doesn't necessarily provide adequate security now. There are alot of books out there that advertise the "Keys" to success, happiness, weight loss, spiritual abundance, the list is endless. Even in the Christian circles many authors have written about "Keys" to Church Leadership or "Keys" to great sermons. Jesus said in Matthew 16:19-"I will give you the keys of the kingdom of heaven, and whatever you bind on earth is already bound in heaven, and what ever you loose on earth is already loosed in heaven." Jesus provides a key, if you will, to heaven and eternal life. It is not a key for deeds or church activities rather a path to grace that each of us must choose. Do your inward conditions reflect your outward acts? Or is the weight of circumstances around you corroding your spirit. The harder you try the more ground you seem to loose, sound familiar? You can free yourself from the challenge of "trying to hold on to Jesus" by letting go of the old attitudes. Once you have asked Christ to become your Lord and Master you have to put away the old habits that inhibit your relationship with God. When you asked Jesus to forgive you it was done, don't let doubt and discouragement cloud your view of who God made you to be. God opens and closes doors in our Christian walk. Be ready to go through the doors He opens and accept the doors He closes. A yes on earth is a yes in heaven and a no on earth is a no in heaven. Let loose the things that keep you from a complete relationship with the Lord by allowing Jesus to turn the key of salvation and opening your heart to Him. There is a verse in Matthew when Jesus asked his disciples, "Who do you say that I am?" Many people that encountered Jesus were wondering if he was the Messiah. Matthew 16:15. As Christmas draws near have you asked that question? With the economy in a spiral and people out of work there are many around us asking that same question. "Where are you God?" Suzanne, my wife, has been having a difficult time this year with the Christmas Season. Usually she is excited about the Thanksgiving and Christmas Holidays, one because she loves being with family and friends and second because she loves sharing with others and helping share Christs love through giving back and helping make Christmas special for others. However, this year is not quite the same. Even after seeing the Singing Christmas Tree she came home and was still not motivated. Now with that being said, she and I both know that those things in themselves don't make Christmas but it is nice to be around friends and share in the joy of the season. In John 3 verse 12 Jesus says it like this, "If I have told you earthly things and you do not believe, how can you believe if I tell you heavenly things?" Have we become so smoothed over by the happenings in our life and the world around us that the miracle of Christ is just another event? Christs' message was a "No Bull" approach. This season ask yourself this question, Who do you say Jesus is? Is he the name on a holiday, a reason to party, an excuse to gather the family together once a year, or is He Messiah, Emmanuel, Risen Savior, Lord of your life. Religion can get old, I see that in many of the churches I come in contact with, but a relationship with a Living God cannot get old. Renew your relationship with Christ today ask Him to come into your life and take up first place in your heart this Christmas. You don't have to be a cowboy to enjoy Bull Riding. It is the most dangerous sport anywhere on the planet. It is also one of the top watched events in television sports today. For those of you new to Bull Riding, the object is to sit on a bull, hold on to a rope wrapped around the bull, and when the chute is opened you hold on and stay on for 8 seconds. 1, 2, 3, 4, 5, 6, 7, 8, it doesn't seem like that long now, does it. But try to hang to a 1,500 to 2,000 pound bull who wants nothing more than to get you off of his back and 8 seconds can seem like an eternity. Got the picture!? For those cowboys who ride bulls it's an everyday occurrence, you just have to maintain the nerve to repeat last weeks ride or not depending on how bad you got hurt. These guys are tuff. It's mental an physical. Sort of like ridding down a bumpy dirt road in the back of a Pick-up Truck going 50 miles per hour with nothing more to hang onto than a rope. Let me know how it works out. On second thought don't even try it, I don't want to know. Leave it up to the pros, ok?! I met Jeff Robinson, who owns a number of PBR bucking bulls, a few weeks ago and he was telling me about a Bull Riding event he was putting on here in Asheville at the old Stockyards on the river. That's all I needed to get involved, other than Jeff's' permission. Scott Collins, who attends our Cowboy Church, is a rodeo judge and he is also one of the judges for the bull riding here in Asheville. So I went down to the Stockyards almost everyday last week just to let Jeff know we were serious about helping and then we watched them transform the stockyards into a bull riding arena. The whole goal of our Cowboy Church is to share the gospel with those who like to cowboy and those that like to be around cowboys. You don't have to be a cowboy to enjoy Cowboy Church, just come as you are and worship the Lord. God wants to know each of us personally. The way we develop that relationship is to ask Jesus Christ to be our Lord and Saviour. I don't want to see any of the bull riders get hurt but if something should happen while they are riding, I want them to trust in Christ for all their needs. Ask Christ to make you into the kind of person He wants you to be. Philippians 3:20 But our citizenship is in heaven, and from it we await a Savior, the Lord Jesus Christ, 21 who will transform our lowly body to be like his glorious body, by the power that enables him even to subject all things to himself. 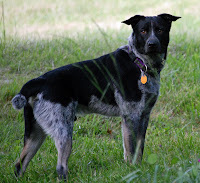 Our dog Fletcher is an Austrailan Cow Dog. He comes from a working cattle ranch in Florida, he's mixed with Catahoula which makes him a little bigger than most Cow Dogs. When we first got him he was just a puppy and many of our friends warned us that cow dogs by nature are an aggressive bunch. But from the time I brought Fletcher home we trained him and had him around people. He has a great personality for people and the other day helped me share the Gospel. Each Wednesday I go over to the Canton Livestock Auction to meet new people for our Cowboy Church. Not to mention it's a great place to hang out. The owner Ed Johnson and I met back in the summer and he has allowed me to come over and hold bible studies and promote our cowboy church. Many of the men there are from the area where we hold our Cowboy Church, so it's a great way to meet new people and promote our Thursday services. Fletcher has not been around alot of cows since we moved to Asheville; horses yes, cows no. So I thought it would be fun to let him get a taste of a real stock yard. Fletcher and I were standing by the truck when a man come over and asked if my dog was a Blue Heeler, so we began to talk about dogs. I told the man that Fletcher was from Florida. He noticed immediately that Fletcher had a nice personality. I told him that Fletcher is the official dog of Cowboy Church. This gave me the opportunity to share with my new friend how we started a cowboy church in North Buncombe county. His eyes lit up. He told me that he goes to a small church outside of Canton but the Cowboy Church seemed like a great way to share Jesus with people that don't like the typical church. This whole conversation and meeting began all because of Fletcher. In 1 Corinthians 9:22, Paul says, I have become all things to all people, that by all means I might save some. As the day went on I met more and more people because of Fletcher being with me, he helps me break the ice with people. I even took Fletcher back into the chutes to help work the cows going into the "Tub", but it was very noisy and crowded and Fletcher wasn't having any of that. The men working the cows liked having Fletcher back there. But in the end sharing Christ with someone is my goal. Some times I find it difficult to just go up to someone and hand them a Cowboy Church postcard and say "come on over!" I tend to be a little shy sometimes. Meeting new people can be intimidating, yes even for a church planter. You may have something you enjoy that can help you share the Gospel, a way to break the ice with people that you haven't thought of yet. Take a moment today and think about what you do and the talents you have. Your witness is within those talents. If it pleases God then allow that part of your personality to help share the Good News of Jesus Christ. You may be the only Christ people ever know. There is a phenominum that occurs here on our mountian roads when it is wet and the tempurature gets to freezing. Moisture freezes on the paved surface and as you drive down the road it looks like a normal road. But you come over a hill and the next thing you know your sliding out of control. Black Ice can be dangerous if you're not expecting it. So when it is raining or even begining to snow the news stations will warn drivers of Black Ice on wet roads. While driving on these mountain roads you have to be aware of the dangers that could cause you to wreck. John 1:9 says, The true light that shines on everyone was coming into the world. This verse talks of the coming Christ. The coming Messiah would reveal a flawed system of trying to reach God and provide a way for a relationship with God through faith, grace and forgiveness. If you don't know there are dangers ahead how do you know what to look for. As this season approaches watch for the signs that indicate you are getting close to slippery surfaces. Sin doesn't come into our life with flashing lights and red and yellow warning signs in our path. It sneaks into our lives a little at a time. Let the true light shine in your life and through this Christmas season. You will be surprised how your light provides a wide beam even for those who may need to see a path during this maze of Christmas confusion. Christ is the light of the world. What a weekend. The news over this Thanksgiving weekend was pretty grim. With the news from Mumbia, India and the throngs of crazed shoppers breaking down doors just to shop was just a bit much for my senses. It made me reflect on the approaching season. My wife has been having a difficult time getting into the "Christmas mood". She doesn't really watch the news that much so her seasonal distress comes from getting the Cowboy Church started and building a home at the same time. Each of which has it's own set of challenges and triumphs. Just how do we Bless God. It was explained to me like this. If you have children, at Christmas time do they by you a present? If they do then where do they get the money to get the present? Usually it comes from Mom or Dad, right! Your children get excited about giving you their present. Then on Christmas morning they come in and say "we have a present for you." When it comes right down to it you paid for your own present but it was a blessing because it was given with love. That's how we Bless God. We give back what He has already given to us. His gift was His son Jesus Christ. If we accept this gift what we give back to God is our talent, time, our service. Take a few moments this morning to reflect and think about how your life is a Blessing to God.